A few years ago, I happily sent in my last car payment for the car I was driving at that time. For a few different reasons, I decided to continue making that “car payment” each month. Keep reading to learn about why I made that decision in the first place, how my strategy has worked out so far, and why I recommend that you always have a car payment. 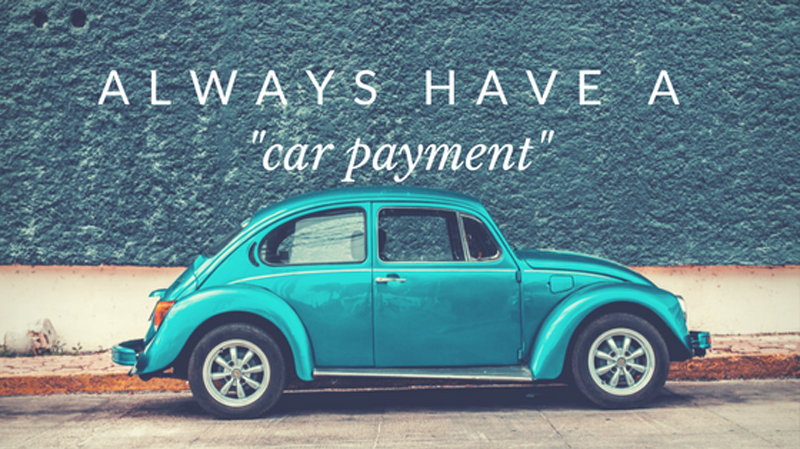 After sending in my last car payment, I took some time and thought about having done that in the past and how good it felt, and how it didn't feel so good when I had to start making a payment again when I needed a new car. In the past, whenever I paid off my car loan the payment got mixed in with my budget. Then when it came time to buy my next car, it felt like I was carving money out in order to start sending checks into a bank again. This time I did something different. I kept making the exact same payment—not to the bank, but to myself. I put the money into a separate “car account.” Since I was already used to making that payment each month, it didn’t affect my budget or cause additional stress. I was blown away at how quickly funds accumulated in this account. My goal was to not buy another car again until I could pay cash. In addition to helping me save up for my next car, this strategy also gave me a dedicated sinking fund for my current car. This really came in handy when I had to replace my tires and fix my air conditioner in one month, for example. I was able to pay for those expenses from my dedicated car account without getting stressed out or feeling like my other financial goals were sidetracked. Even though it wasn't fun to pay that bill, it was covered and that made me feel better about it. By continuing your “car payment” after your car is paid off, you can simultaneously build a sinking fund for your current car—and a savings fund for your next one. So, How Did My Plan Work Out? Well, for better or worse, my plans slightly changed. My car was recalled before I had enough time to build up the funds I was planning on building. At that point, I could have paid cash for a car, but it would have used up all the money I had saved. So, I looked at my current needs and the possibility of not even needing a car in 3–6 years based on the growth of ridesharing services like Uber and Lyft. I decided to keep that “car portfolio” and draw 3% from it. Then I did a 3-year lease that was less than my old car payment. The combination of income from the portfolio and the lower lease payment has decreased my monthly transportation expense. At the end of the lease term, I will still have the portfolio and that stream of income to be used for either another lease or to pay for Uber/Lyft. The exciting thing about this for me is that, at that point, my transportation expense will be mobile and variable. If I'm out of town, my "car expense" will come with me, versus having a fixed expense for a car that is sitting in the lot in St. Louis. When something is paid off, that’s the perfect time to start saving because you’re already used to making those payments. Car payments, in particular, are good to continue because cars involve ongoing maintenance and will eventually need to be replaced. Be flexible. Plans change over time. Unexpected expenses may come up, and new opportunities may arise. This is one example of a savings strategy that I've learned to adopt over the years. If you are just now getting started with savings, don’t feel discouraged. Getting started is often the biggest hurdle! Maintaining a “car payment” on a car that you've recently paid off is a smart, convenient way to begin setting aside money for future expenses. I encourage you to give it a try. If you'd like to discuss this or other savings strategies, contact me! I'd love to chat.